During the holiday season, you want your home to not only look a lot like Christmas, but smell like it too! You can channel the holiday vibe by filling your bath with specific scents that trigger that warm fuzzy feeling. The trusted team of bathroom contractors at DreamMaker Bath & Kitchen of Tyler shares four holiday scents to choose from. Oh, the natural, rustic smell of fresh pine. Even if you can’t put up a Christmas tree in your bathroom, you can still channel its smell with the help of candles, plug-in fresheners or sprays. Cinnamon is a common ingredient in baked desserts and treats usually enjoyed during the holidays. Its almost-spicy fragrance can also be compared to the minty pine smell, only sweeter—as if you can taste it. Imagine finally having some “me time” in your vanilla-scented bathroom after long hours of shopping. Vanilla is always a safe choice as it can be used year-round. With its relaxing aromatherapy properties, you can’t go wrong with this scent. Want to combine citrus and earthy tones? Frankincense and myrrh have you covered. Aside from their authentic holiday scent, these two fragrances are known for helping relieve common respiratory issues too. Call DreamMaker Bath & Kitchen of Tyler today at (903) 253-0165 and let’s talk about how we can freshen your bathroom this holiday season and beyond. 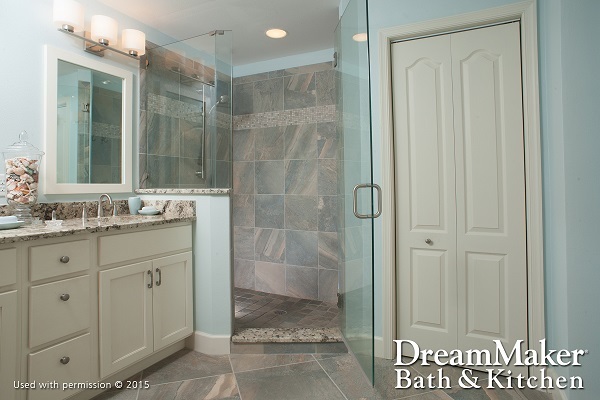 As a full-service bathroom remodeler, we offer tub and shower replacement, bath-to-shower conversions and more. We’ll be with you every step of the way, from design to installation! Should You Move Out During a Remodel? Are Home Improvement Loans Tax-Deductible?